Kim is now well and we are going to still do tarot Tuesday. Take note of date and time! Kim Danbert will host this gathering of Tarot enthusiasts, students and novices alike. 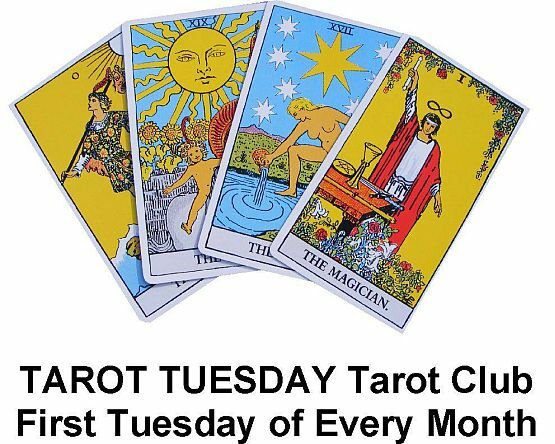 At Tarot Club, you will have a Tarot lesson, discuss Tarot Deck Reviews, Tarot Discussions and Tarot Swaps. Bring a Tarot deck to participate and/or bring a Tarot deck to swap for another deck that you might like. All levels of Tarot knowledge are welcome to come join in the fun. There will be also Tarot Decks for sale at 20% off the suggested retail, and there will be a door price at each Tarot Tuesday!!! April’s topic will be The Garden in the Tarot. As Spring is bringing new growth into our lives, it might be good to investigate the flowers and the plants that live in our Tarot Decks. What is their meaning? What is their history? How can they help us in our interpretations? There is NO FEE for this Tarot Club!!! PLEASE CALL IN ADVANCE TO RESERVE YOUR SPOT(S). Walk-ins welcome. New Books and Beads at 50% Off Retail, Everyday. Deals on Crystals, Tarot Decks, CD's, Findings & More.